It's a familiar scene: A sea of humans in an airport security line, corralled by those stands with retracting ribbons (they're called stanchions). Stone-faced men scrolling BlackBerries, whining kids, and that lady who used a gallon bag for toiletries instead of a quart. And then, suddenly, some savvy guy in a blazer walks up to security, flashes his credentials, and strolls on to what looks like a VIP line devoid of the usual airport riff-raff. "TSA Pre✓", he says with a wink. You've seen the signs. You probably have friends who are in the club. Maybe you even were randomly chosen for the TSA Pre✓ line before and thought it was just a good hair day that got you in. But you still have no idea what TSA Pre✓ is. 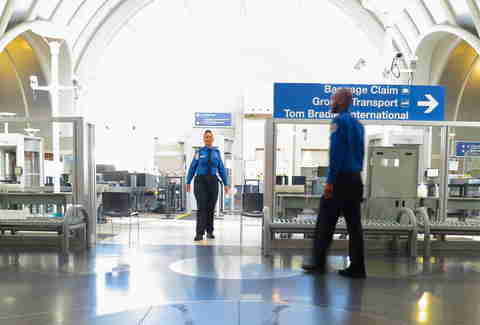 To trim ever-winding airport lines, the Transportation Security Administration has rolled out a program that eliminates a few cursory security checks for approved frequent fliers. And in typical government fashion, it has a fancy name: TSA Pre✓. No, this is not TSA Precheck, but TSA Pre✓, a service that likely won't play nice with Google search, but will certainly piss you off the more times you read it in print. Seriously. Try reading the TSA's website without wanting to snap that ✓ like a wishbone. From here on out, we will kindly refer to it as PreCheck, TSA be damned. For the uninitiated, 3-1-1 refers to having 3.4-ounce-or-less bottles in a 1-quart bag, with one bag per passenger. As TSA press secretary Ross Feinstein told Thrillist, the goal of the program is to get approved travelers through airport security in five minutes or less. U.S. citizens, nationals, and residents with a clean criminal record are encouraged to apply. PreCheck also comes with any of the U.S. Customs and Border Protection Trusted Traveler programs, including Global Entry, Nexus, and Sentri. More on those later. Well, are you an ex-con from another country? If so, then no. But if you're an upstanding citizen and fly often inside the U.S., it's probably worth your time. Meghan Callaghan, a travel writer and editor with nearly a decade of experience, told Thrillist that TSA PreCheck is an invaluable timesaver. She got PreCheck when she was approved for the Global Entry program, which is geared toward Americans who travel internationally. "I've gotten to the airport, through security, and to my gate in five to 10 minutes", Callaghan said. "Everybody should do it", she noted while depositing a modest check from TSA at her local bank. Just kidding! Nobody goes to the bank anymore. Along with completing forms online, candidates must pay the fee and submit biographic information at an application center. Feinstein told Thrillist that, in addition to 22 locations inside airports (including two at LAX), the program now has 247 spots outside, as well. Appointments are scheduled well in advance, so be sure to set aside time to get there. The actual interview process involves showing proof of citizenship, fingerprinting, a brief Q&A about your travel habits and personal life, and a dramatic reading of the Magna Carta. OK, that last part isn't true. But the application basically includes paperwork and in-person background check to make sure you're not shady. Or if you are shady, to confirm that in person so you don't breeze through airport security. "It's well worth 100 bucks", said Pat Forde, a medical device sales manager who flies weekly, as he deposited a modest check from TSA into his savings account. Again, we kid. "Most people don't know how to travel well, what to do in security lines, when to take their shoes off", Forde said. "To kinda go on an express lane with fellow travelers who know the deal is a lot better". In fact, TSA PreCheck lasts for five years. Other programs that include PreCheck have different costs: Nexus costs $50; Global Entry costs $100; and Sentri costs $122.25. Each lasts for five years. That's not really a question, but OK. You're not alone. According to a recent survey conducted by Harris Interactive, nearly 68 percent of Americans believe TSA PreCheck is actually making air travel less safe. The majority of respondents said they were concerned loosened security screenings opened the possibility for bad guys to slip through the cracks. In addition, 56 percent said they "don't think it's fair to treat passengers differently from one another". But as Grant Martin pointed out in Forbes, this opinion doesn't take into account the extensive background checks required of all the TSA pre-screening programs. 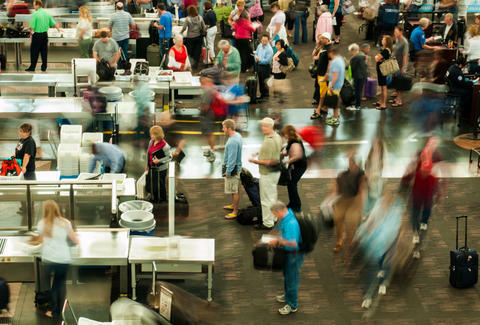 Our takeaway: Americans taking polls about airport security are cranky. Why wouldn't I just get Global Entry if it includes TSA PreCheck? Actually, you should just get Global Entry. Even the TSA thinks so. "Global Entry is a better deal, hands down. We tell people that", Feinstein told Thrillist. "It's a great deal. But only 30 percent of Americans have passports". Seriously, that's a really sad statistic. But it's also an essential difference: If you don't have a passport, you can still get TSA PreCheck. You'll need a passport for Global Entry, however, and it costs $15 more. But that's spread out over five years. Who shouldn't get TSA PreCheck? People with artificial joints and metal plates in their bodies may not want PreCheck, as they'll prefer advanced imaging screenings over use of a metal detector. Also, if you don't like saving time, then TSA PreCheck isn't for you. Why did my cousin Cletus randomly get PreCheck that one time? It happens. Known travelers will occasionally get randomized PreCheck. It's like getting the first chapter of an eBook for free -- it's a marketing tool designed to get you hooked. Your first taste might be free, but you'll have to pony up the cash to keep getting your fix. 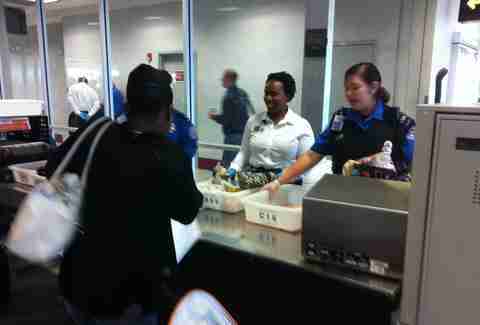 Yes, we just compared the TSA to a drug dealer. But in reality (or so they say), the randomized entrance is to keep PreCheck lines full and to cut down on congestion in the regular lines. Which also means more experienced travelers might not be happy to see the newbies. "It messes up the whole process if they give it to a 75-year-old woman who hasn't traveled in 5 years and she takes off all her stuff", Pat Forde said. "That's the unfortunate reality for people like me who know how this works". TSA PreCheck isn't available at every airport. And it isn't guaranteed to be running when you're at airports that use it. But the program is growing; since Dec. 4, more than 245,000 people have applied for PreCheck, with an average of 3,500 new applicants coming in every day. "Part of me wants to recommend it to everyone, because it's awesome", said Brandon Gross, a frequent traveler and assistant director for the student center at the University of Miami. "But part of me doesn't because I don't want more people in my line". Gross then high-fived a TSA agent and proceeded to deposit his modest check at the ATM. But as Feinstein points out, the more people know about the program and subsequently use it efficiently, the quicker lines will be for everyone. "If you're willing to wait 15 minutes for your double espresso soy latte, why wouldn't you want to get through airport security in five minutes?" Feinstein said. Now get out of here and get TSA PreCheck already. Ryan Craggs is Thrillist's travel editor, who is a hypocrite who does not yet have TSA PreCheck. But he's applied for it. Follow him @ryanrcraggs.